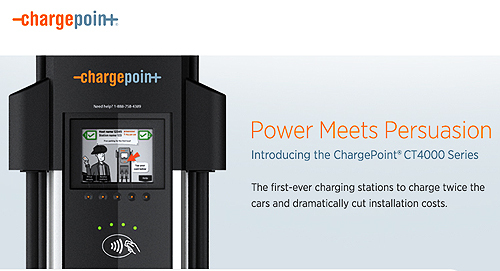 ChargePoint has just introduced the new CT4000 Charging Station at reduced installation costs and yet allowing the recharge of two electric vehicles simultaneously. Since the delivery of the first Tesla Roadster in 2008, the number of electric, zero-emission vehicles in the US rose to 100,000 by last May. In the first half of 2013, EV sales are up by 40 percent, showing the transition to electric transportation is beginning to pick up steam. Even so, the nation is falling far short of Obama’s stated goal of a million EVs on the road by 2015 and the corresponding recharging network lags farther behind yet. The new CT4000 may be just the jumpstart the EV community needs. "The electric vehicle market is accelerating at an incredible rate and electric vehicle infrastructure needs to not only pace that growth, but stay ahead of it," said Pat Romano, President and CEO for ChargePoint. "The CT4000 Series changes the equation by offering more charging ports at every station while dramatically cutting installation costs. The CT4000 is truly a customer-centric EV charging station. Its creation is the result of understanding the needs of both drivers and station owners alike." This is the first charging station to offer dual simultaneous charging from a single circuit, doubling charging capability with no increase in installation costs. It also features what the firm refers to as Clean Cord Technology – that is a self-retracting, no maintenance, lightweight cord management system – a standard feature on all CT4000 models that makes charging easier and more convenient. To make the unit more attractive to the hosting company, the recharger enables a customizable promotional message on a 5.7-inch LCD screen accessed via ChargePoint's cloud service. Remarkably, the touchscreen is functional in all weather conditions, save perhaps flashfloods or tornado-level winds. Then the problem is just keeping the vehicle connected to the recharging cord, no? A built-in signage feature allows owners to further tailor the CT4000 to their needs. In addition an interactive and user-friendly instructional video is available in English, Spanish or French. Reportedly, ChargePoint has already received hundreds of orders for this new model from established customers, meaning the useable network of recharging stations should begin to show some growth. The company already boasts placement of some 12,000 independently owned stations in more than a dozen countries making it the largest such network of recharging stations in the world. At 70 percent of the overall market, ChargePoint is leading the way to the recharging grid of the 2020’s. So as we witness the greening of American streets, Electric Avenue is extending its reach and accessibility.